This histology slide (1) is gallbladder. It shows the simple columnar epithelium. Note that the cells are taller than they are wide. Also notice how the nuclei line up in a nice neat row on the basal surface. Compare the positioning of the nuclei in simple columnar epithelium (1) to the position of the nuclei in pseudostratified columnar epithelium. 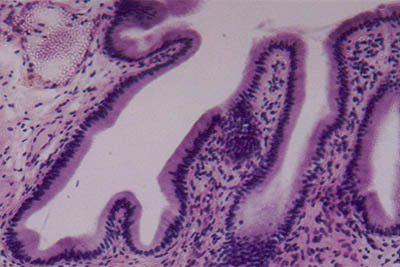 This histology (2) slide is large intestine. It shows the simple columnar epithelium. Note that the cells are taller than they are wide. Numerous goblet cells are present in this histology slide.